4,Special design enclousewith high quality alloy and tempering glass. 6,Automatically adjust the brightness according to ambient light intensity, all-weather outdoor considerable. 9,Supports remotely monitoring the running of the device. Double screen can attract more people to see its video advertising when they walking around the way.They can play the same media advertising or not the same if you wish. Full HD 1920x1080 Touch Screen, support display models of 16:9, 9:16(Horizontal/Vertical) etc. Multi-groups of on/off time schedule could be set remotely and control the digital poster through the Internet. Multi zoning: Display content in random split screens, play videos in multi-windows, play different media in different windows. Update files: Updating, downloading, deleting, changing and copying files by internet; can changing the file name and changing playlists by internet. Support media contents combine by videos, pictures, flashes, marquee etc. Functions for controlling the play list, displaying in order the programs and playing loop. Playlist: the files controlled by playlist; updating the playlist in real time;switch automatically in different hours each day. Rolling titles in English, various display modes for titles (fonts and colors of letters,background colors, the relative attributes of rolling directions in horizontal or vertical can be adjusted). Support uploading files through a wireless and cabled network. Intelligent system for arranging and playing programs, easy and fast operation. Able to adjust the volume and power on/off the units by remote control. Remotely wake up, restart, pause, play; available on-line real-time monitoring playback screen and the machine working condition. 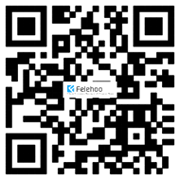 Felehoo Double sides digital advertising solutions for retail shopping centers, restaurants, hospitals, medical centers, schools, arenas, convention centers, gas station pump tops etc. It is an increasingly popular way to advertise to potential customers outside in public areas. For the demanding outdoor environment,it can offer both standard and custom digital display screens to suit your needs. High brightness, high contrast, moisture proofing and dust protection all make Felehoo's outdoor digital screens the best digital signage option for digital advertising in outdoor environments. 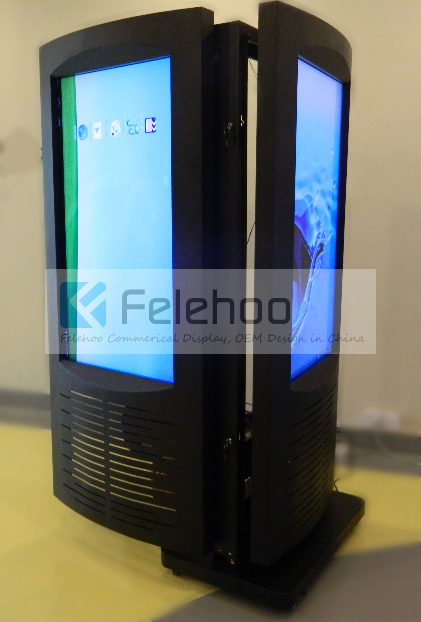 What benefits you get of using outdoor double sides digital signage totem as marketing tools ? Where outdoor double sides digital signage totem can be used? 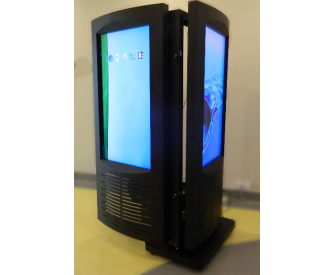 outdoor double sides digital signage totem is perfect digital advertising display at retail points and public locations where you want to display your digital advertisements repeatedly, and don’t require changing / updating your advertisements content frequently.